Eta Carinae’s great eruption in the 1840s created the billowing Homunculus Nebula, imaged here by Hubble, and transformed the binary into a unique object in our galaxy. Astronomers cannot yet explain what caused this eruption. The discovery of likely Eta Carinae twins in other galaxies will help scientists better understand this brief phase in the life of a massive star. Image credits: NASA, ESA, and the Hubble SM4 ERO Team. Eta Carinae, the most luminous and massive stellar system within 10,000 light-years, is best known for an enormous eruption seen in the mid-19th century that hurled an amount of material at least 10 times the Sun’s mass into space. This expanding veil of gas and dust, which still shrouds Eta Carinae, makes it the only object of its kind known in our galaxy. Now a study using archival data from NASA’s Spitzer and Hubble space telescopes has found five similar objects in other galaxies for the first time. 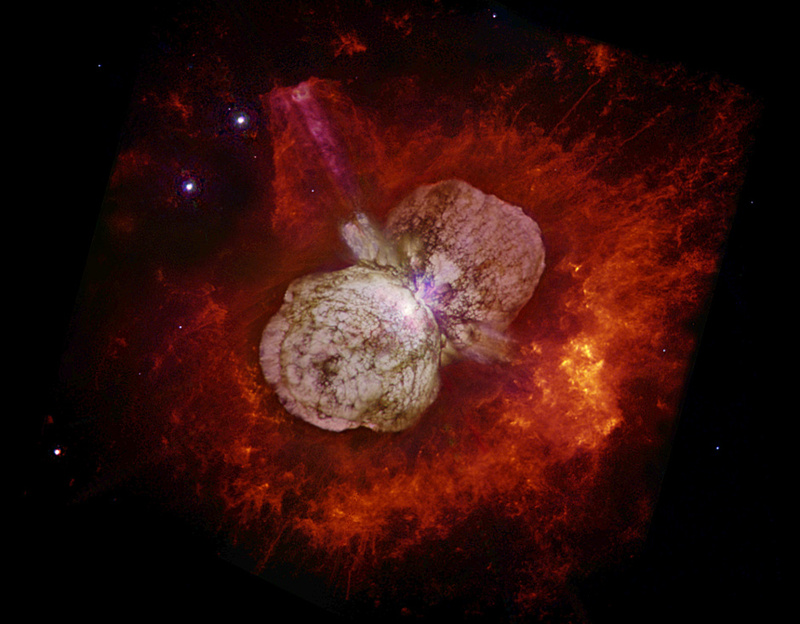 As one of the nearest laboratories for studying high-mass stars, Eta Carinae has been a unique, important astronomical touchstone since its eruption in the 1840s. To understand why the eruption occurred and how it relates to the evolution of massive stars, astronomers needed additional examples. Catching rare stars during the short-lived aftermath of a major outburst approaches needle-in-a-haystack levels of difficulty, and nothing matching Eta Carinae had been found prior to Khan’s study. The nearby spiral galaxy M83 is currently the only one known to host two potential Eta Carinae twins. This composite of images from the Hubble Space Telescope’s Wide Field Camera 3 instrument shows a galaxy ablaze with newly formed stars. A high rate of star formation increases the chances of finding massive stars that have recently undergone an Eta Carinae-like outburst. 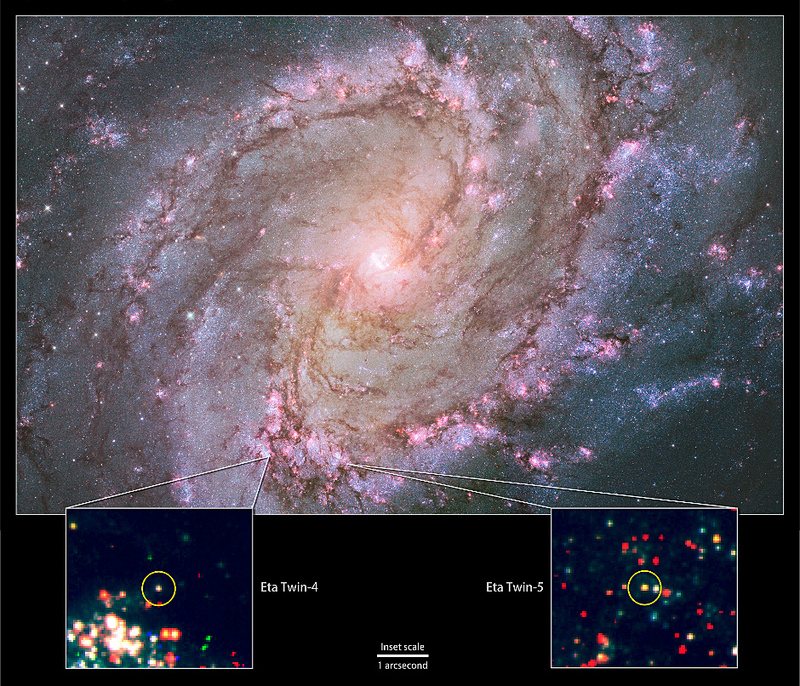 Bottom: Insets zoom into Hubble data to show the locations of M83’s Eta twins. Image credits: NASA, ESA, the Hubble Heritage Team (STScI/AURA) and R. Khan (GSFC and ORAU). In a follow-on survey in 2015, the team found two candidate Eta twins in the galaxy M83, located 15 million light-years away, and one each in NGC 6946, M101, and M51, located between 18 million and 26 million light-years away. These five objects mimic the optical and infrared properties of Eta Carinae, indicating that each very likely contains a high mass star buried in five to 10 solar masses of gas and dust. 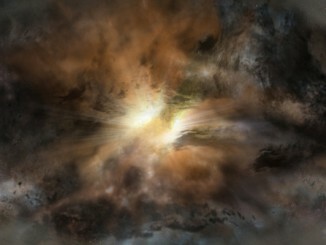 Further study will let astronomers more precisely determine their physical properties. 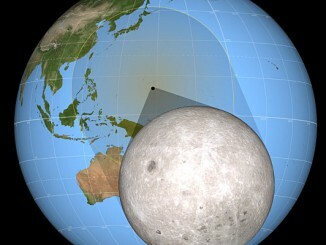 The findings were recently published in The Astrophysical Journal Letters. Researchers found likely Eta twins in four galaxies by comparing the infrared and optical brightness of each candidate source. Infrared images from NASA’s Spitzer Space Telescope revealed the presence of warm dust surrounding the stars. Comparing this information with the brightness of each source at optical and near-infrared wavelengths as measured by instruments on Hubble, the team was able to identify candidate Eta Carinae-like objects. Top: 3.6-micron images of candidate Eta twins from Spitzer’s IRAC instrument. Bottom: 800-nanometre images of the same sources from various Hubble instruments. 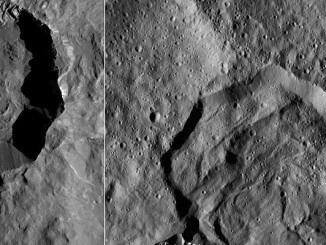 Image credits: NASA, ESA, and R. Khan (GSFC and ORAU). NASA’s James Webb Space Telescope (JWST), set to launch in late 2018, carries an instrument ideally suited for further study of these stars. The Mid-Infrared Instrument (MIRI) has 10 times the angular resolution of instruments aboard Spitzer and is most sensitive at the wavelengths where Eta twins shine brightest. “Combined with JWST’s larger primary mirror, MIRI will enable astronomers to better study these rare stellar laboratories and to find additional sources in this fascinating phase of stellar evolution,” said Sonneborn, NASA’s project scientist for JWST operations. It will take JWST observations to confirm the Eta twins as true relatives of Eta Carinae.